Open your eyes on the world! As I travel through Uzbekistan now the mountains have all but disappeared and a dusty haze settles on the landscape. 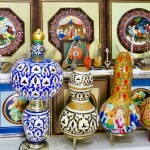 But the road is paved with iconic Silk Road towns – ahead of me lie the almost mythical places of Samarkand and Bukhara. As I’ve passed through towns and cities linked to the old Silk Road trails I’ve often been disappointed to discover modern cities and local bazaars filled with plastic items made in China that wouldn’t last 10 minutes let alone 10 centuries. While I can’t begrudge these regions their modernisation it requires immense imagination to conjure up the travelling caravans of camels and horses that carried silk and tea and other goods from east to west in centuries past. Crossroads such as Samarkand however were important centres during the Islamic Golden Age (along with Baghdad and Damascus) where science, philosophy and the arts flourished more than 1000 years ago. The first schools and universities of the time emerged in the Islamic world (indeed I have previously visited the oldest university in the world Al-Karaouine in Fez, Morocco which was established in the 9th century). 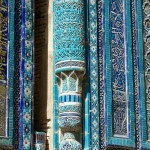 The city of Samarkand in the 14th century regularly admitted boys for Islamic instruction but also for secular teaching of subjects such as astronomy and philosophy. 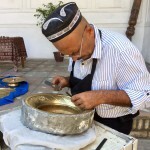 Today academia and the arts live on in Uzbekistan. 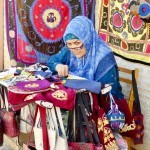 It has been a joy to discover some of the living artisans carrying on crafts that would have filled the bazaars in ancient times – from coppersmiths to woodcarvers, silk weaving and carpet knotting, silk paper making and the painting of calligraphy and Persian miniature style. 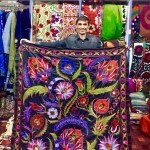 This entry was posted in Uzbekistan and tagged Silk Road, Uzbekistan. Bookmark the permalink. I second that. Surely the book must come out one day!!!! What a wonderful trip. An insight for me into a place I had never previously given a thought to. Thanks KP, it is such a buzz being on your mailing list!